Announcing Paul Chitlik's 7th Annual Rewrite Seminar! See RETREATS for further details! Reserve your place now! Scripts aren't written, they're REWRITTEN. Most major motion pictures go through 25-30 drafts before they hit the sound stage according to top writers I’ve spoken to. I did 27 drafts of a movie for television before we rolled. I’m not saying you’re going to need to do that, so you can pick yourself up off the floor. But rewrites are written into most contracts, even when you sell a spec script, so you just have to face facts: No script is ever ready with just one draft. If you’re writing a spec, you don’t want to show it to anyone until it’s in the best condition it could possibly be. You want to put everything you know into it. You want it to be the best example of your skill as a writer, and you want it to have the most impact it can have. You want to be able to say, at least to yourself, that’s the best I can do. Even if you’re paid to do the rewrite, per your contract, you’re going to want to do several drafts before you turn it in, just to make sure you’ve dealt with all the producer’s notes and done the best you could so that you’re not cut off, and you retain the production bonus and residuals. That’s where the real money is. Writers in Los Angeles and New York have writers’ groups that help them guide their rewrites. But if you’re not in those cities, or you don’t know any writers yet, who can you turn to? Now, you can turn to this site, home of the Rewrite Mentor. Information on publications (especially REWRITE, A Step by Step Guide to Strengthen Structure, Characters, and Drama in Your Screenplay). Newly available: Paul's Twilight Zone scripts and novels. Check them out at Digitalfabulists.com. News about screenwriting RETREATS, including the Summer 2013 retreat in Italy. Practical advice from the Rewrite Mentor in his BLOG. Information about the Mentor's services and personal appearances. Links to interviews and articles. Links to The Writers Store, a specialty store that serves the needs of screenwriters. If you want more personal attention, that’s available, too. The Rewrite Mentor will read your script, write a report, and consult with you by telephone or Skype so you can get started on your next draft. 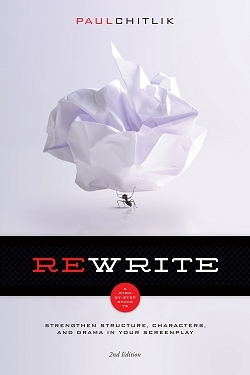 So who is the Rewrite Mentor? Have a look at veteran film and television writer and film school professor Paul Chitlik’s credits and bio and find out. Cruise the site. Ask a question. Procrastinate as long as possible, then get started on a rewrite that can take your script to the next level. SCREENWRITING QUESTIONS ANSWERED! A fantastic, in-depth, indexed video interview with Paul from Mahalo. Paul Chitlik's Twilight Zone scripts are available again. Written with writing partner Jeremy Finch for The New Twilight Zone in the 1980s, and long out of print, they are now available as Kindle books from Digitalfabulists.com and Amazon.com. Look for more in the near future, including two previously published novels by Paul and an exclusive sequel in the Berns series never before published.